The supernatural seems to be all the rage nowadays. The silver and big screens are filled with zombies, vampires, demons, spirits, you name it. Prior to the latest trends, the 1990 movie Ghost starring the late Patrick Swayze and Demi Moore was a blockbuster hit. Not only was it the top-grossing movie of 1990 but it took home Oscars for Best Original Screenplay and Best Supporting Actress (Whoopi Goldberg). The theatre trend started with musicals becoming movies like Mama Mia and Rent, but lately, the trend has moved in the opposite direction to include Ghost. Can movies be turned into musicals and still retain the original vision of the screenwriter? As I anxiously awaited the opening number in the orchestra section (main floor) of the Straz Center for Performing Arts‘ Carol Marsoni Hall, I pondered this in my head. I happened to notice in the program that Brian Joel Rubin wrote the script for the musical as well as the movie which increased my optimism and my excitement. Now, as I have previously written in prior reviews, I love the theatre and especially musicals. I have experience on stage as a performer and behind the scenes as a designer and director, which is why my reviews tend to get a little in-depth. This one will be no different. Ghost’s plot centers around Molly(Katie Postonik), who is in danger after her lover Sam Wheat(Steven Grant Douglas) is murdered. Sam, now a ghost, using a reluctant psychic, Oda Mae Brown(Carla R. Stewart) tries to save her. This musical was a multimedia extravaganza, with video being used as an introduction and as background, and foreground for a good amount of the duration of the show. For example, video of stock tickers, traffic and crowded sidewalks as a background for a dance number to symbolize the hustle and bustle of New York City. Most of the time, the ocular stimulus was way too much. It pulled from the actors’ performances as well as the dancers. There was so much going on that my eyes didn’t know where to focus. I literally had to decide what of the action going on-stage was supposed to be the central focal point. My eyes didn’t feel that way all the time. The scenes underground with the Subway Ghost(Brandon Curry) were incredibly vivid and they worked really well. Unfortunately, most of the other moments where the talented dancers of the ensemble were visually drowning in the fast-moving video that played around them. There was a point that any audience member, focusing stage right, would miss some amazing movements going on stage left, due to the multimedia being shot in the foreground. When I am asked to review shows at the Straz, it usually opening night in order to turn around the article so it can be used for marketing purposes. In my experiences as an actor and director, sometimes tweaks are taken care during opening night. There are the different sound, lighting, and technical obstacles that appear when the house is full of warm bodies which then lend to acting struggles as well. With that being said, I was disappointed with the performances of both Katie Postotnik(Molly) and Steven Grant Douglas(Sam). Not only were their singing voices falling flat more times than not, but the chemistry and the heat needed between them was just slightly more than a flicker. There were small moments here and there, but they were few and far between. The singing was flat overall without prejudice of the performer, which lead me to believe that maybe the monitors that feed the music on stage may not have been fully functional. If the performer does not hear the same pitches as the audience there will be perceptual differences which could sound like their singing is falling flat or sharp. Robby Haltiwanger, who portrayed Carl Bruner, had more chemistry with Molly in the few scenes they shared than the entirety of scenes with Sam. There was a fleeting moment between them, but it had enough heat that it seemed to linger on stage for the rest of the show. Regardless, of the fact that he too fell flat during most of his singing numbers, his acting skills seemed far superior to those of Molly and Sam. The best performances came from Carla Stewart(Oda Mae) and those performers playing her sisters, Lydia Warr(Louise) and Evette Marie White(Clara). Their pitches were spot on, and they seemed to have more fun on stage than a lot of the other performers. The characters of Oda Mae and her sisters are what I would consider the comic relief to what should have been a very emotional story. They brought much-needed hilarity at a point where the rest of the show was failing. My opinion must have shared with a number of the other audience members because it was only when these talented women came out for the curtain call that the ovation became standing. ht have made different choices that would have played to her strengths. 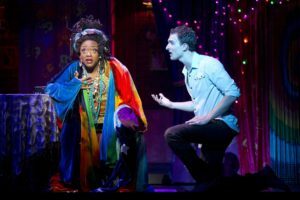 When a new musical is first presented on Broadway and then sent on tour, it usually takes five years for the rights to the show become available. During those five years there are minimal changes that a director can make from the original Broadway version, so a lot of the issues I mentioned may have fallen into that category. In summary, while there were some great moments, the multimedia, inferior acting and pitchy voices tended to distract from what was an award-winning script. 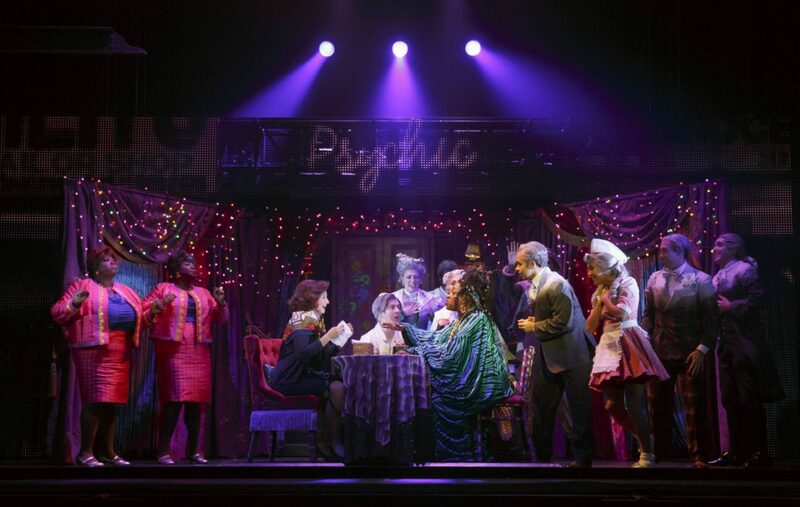 Ghost is playing at the Straz Center for the Performing Arts through Sunday, April 27th. For more info please see the Straz Center website.